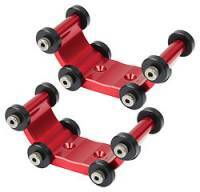 At Moose Blocks our commitment is to provide the best quality sprint car parts on the market – without exception. Our key is simplicity, both in design and in our dealings with clients. We focus on the important things – quality material, American-Made, easy to use products at affordable prices. Moose Blocks Chassis Set-Up Blocks - Short - 1.75"-4"
Moose Blocks Chassis Set-Up Blocks - Tall - 3"-6"
Steven “Moose” Brokenshire founded Moose Blocks, Inc., in 2002, in York, PA. Moose bought a used CNC machine and embarked on a career in making custom parts for sprint cars. By 2003, the growing operation relocated to York Springs into the shop of Don Ott Racing Engines where Moose leased a portion of the building. In 2005, just three years after Moose Blocks’ creation, Moose's company expanded for a second time and moved into its current location in New Oxford, PA. Moose Blocks is located in a new 3,500 square foot building. 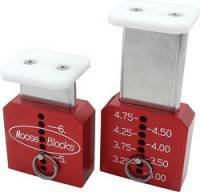 Due to rapid growth, steady success, and an expanding and diversified product line, Moose Block’s utilizes three CNC machines that run at multiple shifts to keep up with its manufacturing, distribution and whole-sale demand. Moose continues to grow his product line as he has formed a working relationship with the top crew chiefs in the country and is working to meet their needs for the best quality and performance products available. Today, Moose Blocks is a stable, profitable business offering precision machining and excellent customer service. We have evolved into a full-service custom machine shop that supplies sprint car parts to dealers all across the United States, Australia and New Zealand.